We really enjoyed the experience at Lux Bond & Green. The people working at the store are friendly and helpful. We felt very much at ease there. When you walk into Lux Bond & Green, everything about the place makes you feel like you made the right choice. As we explain here, there is no way a physical retailer can compete with online retailers like James Allen or Blue Nile. As our secret shopping bore out, you will save about 25 – 30% shopping online. That said, it’s not always about the dollars and cents. Some people just want to buy in person. If you are willing to pay that premium, Lux Bond & Green seems to be an excellent choice. If wisdom comes with age, Lux Bond & Green must be a genius by now. Having opened their store way back in 1898, I can say that Lux Bond & Green is the oldest United States based retailer I have ever visited. The founder, Morris A. Green, had roots going back even further than that, having operated a horse and cart jewelry business around Waterbury, CT prior to opening the store. Lux Bond & Green is still family owned and operated, with the fourth generation running operations today. They now have six locations in Connecticut and Massachusetts. Secret shopping Lux Bond & Green was a painful experience to endure. While I am not a Yankees fan, I am a native New Yorker and lifelong Mets fan. It was painful to have to walk into the official jeweler of the Boston Red Sox. All joking aside, we were very impressed with the ambiance of the store. Lux Bond & Green gives off the classic luxury vibe when you walk in. They aren’t trying to be trendy or to blow you away with bling. My first reaction walking in was that Lux Bond & Green feels like a place to part with a lot of your hard earned money (in a good way). The sales staff was energetic and ready to help us. We meandered around a bit before finding the right showcase. Laurie in particular was very helpful. Since I didn’t give her a hard budget, she had us try similar rings with different size diamonds, without pressuring us. It was refreshing to be able to try different rings on without getting the constant upsell. It’s very common to have salespeople sneak in all kinds of phrases intended to separate the most expensive diamond (a.k.a. the biggest commission) from the pack. Laurie did not do that at all. We actually felt like we had an ally there in helping us find the right diamond. So did Lux Bond & Green’s jewelry live up to the ambiance and service? It did. The first ring we settled on was a 1.77ct J color, VS1 clarity excellent cut round diamond for $16,400. 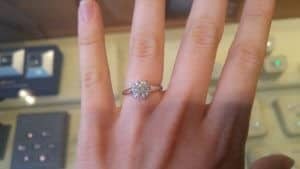 They had it mounted in a platinum solitaire setting that ran another $2,000. The diamond was very beautiful. I loved the proportions, and we did not notice any yellow at all. The second diamond was a J color and excellent cut as well. This one was a 1.31ct and SI2 clarity for $7,495. 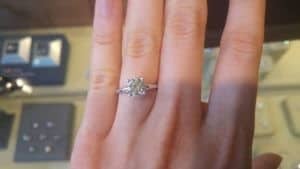 It was paired with a slimmer platinum solitaire setting which cost $1,295. We liked this diamond as well. I am normally not a fan of 60% tables on round diamonds, but this diamond had quite a bit of brilliance, so I’ll let that slide. I really liked the 1.77ct diamond. So how does it stack up to the competition? Here is a stunning 1.84ct J color VS1 clarity excellent cut round diamond from Blue Nile for $11,773. The diamond from Blue Nile is a little larger, yet the Lux Bond & Green diamond is 28% more expensive. Moving on to the second diamond (the 1.31 J SI2), I decided to compare it to a selection from James Allen. Here is a 1.30ct J color, SI2 clarity excellent cut diamond for $5,640. I prefer this diamond over the Lux Bond & Green one (the aforementioned table issue) and again you are saving about 25%. While we are comparing, there were similar disparities when looking at the settings as well. Here are the comparable settings from Blue Nile and James Allen respectively. In both cases, the savings are over 35%.